Aim: To compare the healing pattern in palate following harvestation of connective tissue graft by two different techniques and to compare the recession coverage at the recipient sites. Materials and Methods: 30 recession sites with Miller's class I and II recession in 16 patients were recruited for this study. Sites were randomly divided into 2 treatment groups. Group I used Unigraft Knife to harvest the connective tissue whereas in group II patients Langer & Langer techniques was used to harvest the connective tissue graft from the palate. Healing was evaluated at the donor site using- wound size(WS), immediate bleeding (iB) and delayed bleeding (dB), complete wound epithelialization (CE), sensibility disorders (S) and post operative pain (PP) at baseline, 1st, 4th, and 12th week postoperatively. Recession coverage was assessed by measuring Clinical Attachment Level (CAL), vertical recession (VR), width of keratinized gingiva (KT). 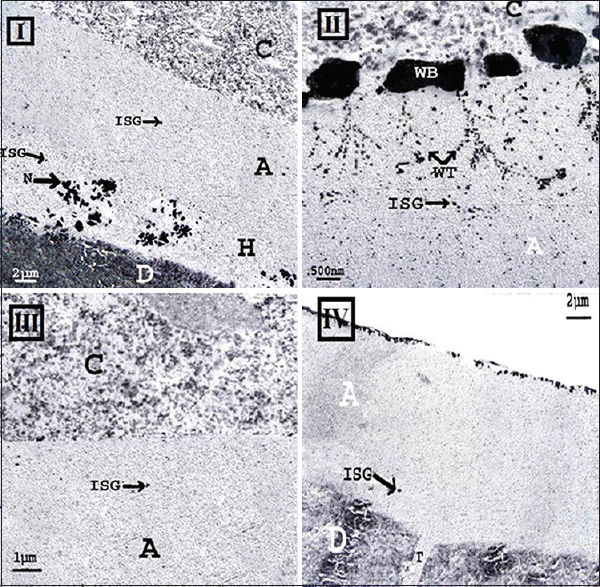 Results: On comparison between Group I and II, a statistically significant larger wound size was observed in Group I. CWE was higher in Group II. A non significant difference was observed when SD, and delayed bleeding were compared at all time intervals. A non-significant difference was observed in the clinical parameters at the recipient site. Conclusion: When evaluating the WS and CWE, the Langer and Langer technique was found to be better than the Unigraft knife technique for harvesting the connective tissue graft, whereas both the techniques were found to be effective in root coverage procedure outcomes. 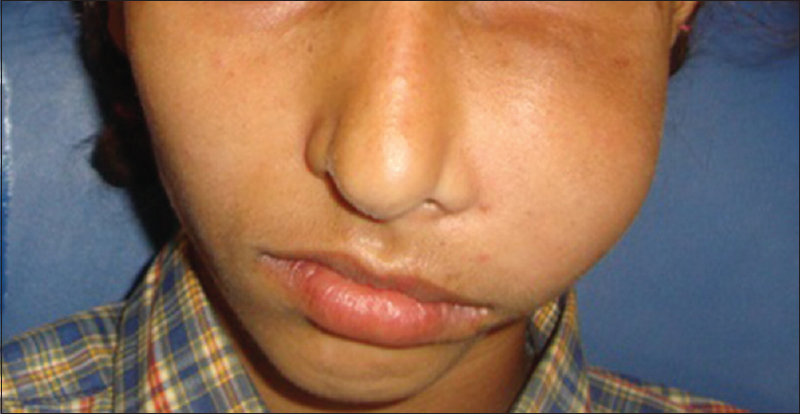 Background: Molar incisor hypomineralization (MIH) is a developmental defect. The prevalence of MIH ranges widely from 2.4% to 40.2%. 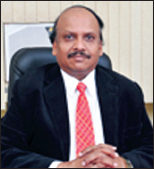 Aim: This study was under taken to determine the prevalence of MIH in 7–9-year-old children of Bengaluru City, India. Materials and Methods: A cross-sectional epidemiological study was conducted in a representative sample of 2500 school children aged 7–9 years of Bengaluru, India. Oral examination was carried out by a single trained calibrated examiner under natural daylight. Results: Twelve children (0.48%) were diagnosed with MIH. A total of 68 teeth were observed with MIH. All four first permanent molars were affected in 50% of children. In the molar group, mandibular molars (29.41%) were more frequently affected than maxillary molars (27.94%). Conclusion: The prevalence of MIH in 7–9-year-old children of Bengaluru was 0.48%, with no gender predilection. Background: Dual-cured composite resins are similar to self-cured composite resins in some of their clinical applications due to inadequate irradiation, lack of irradiation, or delayed irradiation. Therefore, incompatibility with self-etch adhesives (SEAs) should be taken into account with their use. On the other, the extent of dentin dehydration has a great role in the quality of adhesion of these resin materials to dentin. The aim of this study was to investigate the effect of dentin dehydration and composite resin polymerization mode on bond strength of two SEAs. Materials and Methods: A total of 120 dentinal specimens were prepared from extracted intact third molars. Half of the samples were dehydrated in ethanol with increasing concentrations. Then Clearfil SE Bond (CSEB) and Prompt L-Pop (PLP) adhesives were applied in the two groups. Cylindrical composite resin specimens were cured using three polymerization modes: (1) Immediate light-curing, (2) delayed light-curing after 20 min, and (3) self-curing. Bond strength was measured using universal testing machine at a crosshead speed of 1 mm/min. Data were analyzed with two-way ANOVA and Duncan post hoc tests. Statistical significance was defined at P < 0.05. Results: There were no significant differences for CSEB subgroups with hydrated and dehydrated dentin samples between the three different curing modes (P > 0.05). PLP showed significant differences between subgroups with the lowest bond strength in hydrated dentin with delayed light-curing and self-cured mode of polymerization. Conclusion: Within the limitations of this study, a delay in composite resin light-curing or using chemically cured composite resin had a deleterious effect on dentin bond strength of single-step SEAs used in the study. Objective: To evaluate bony reconstruction of the atrophic anterior maxilla using particulate grafts with or without autologous bone marrow aspirate concentrate (BMAC). 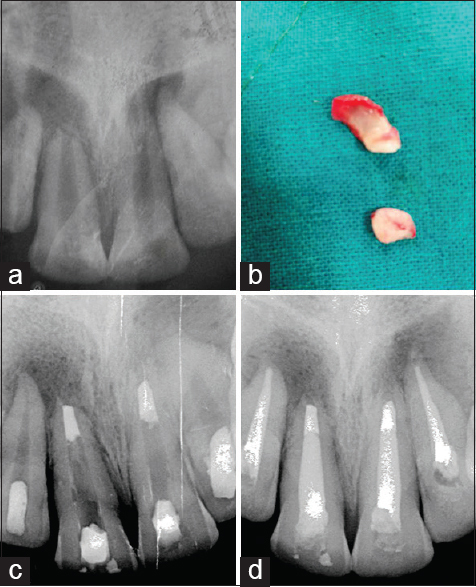 Materials and Methods: Eight patients with atrophy of the anterior maxilla due to teeth loss were selected and split into groups according to the type of material used: Control Group (CG) (n = 4) - particulate xenograft only and Test Group (TG) (n = 4) - a combination of particulate xenograft and BMAC. Both groups received a collagen membrane to cover the xenograft. After 4 months, during implant placement, a sample of bone was removed from the graft area using a 2 mm diameter trephine bur. The specimens were fixed and preserved for histomorphometric evaluation, which included the following parameters: Mineralized tissue (MT) and non-MT (NMT). 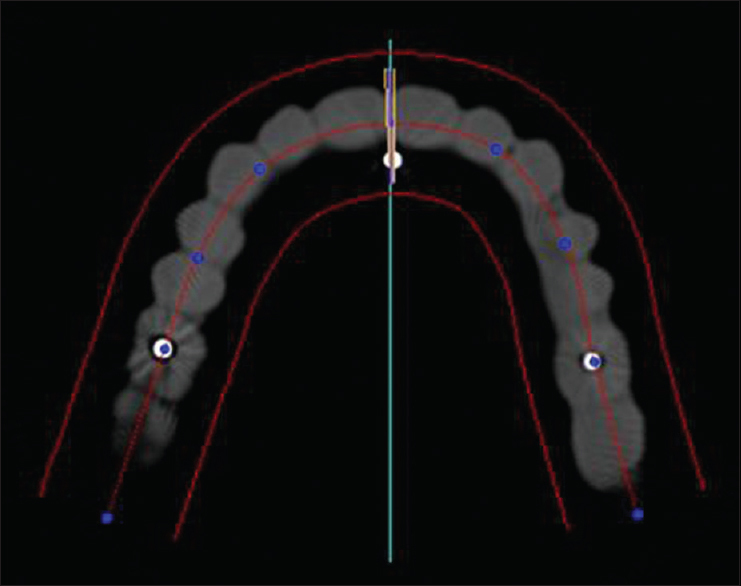 Cone beam computed tomography was performed at 3 time intervals to measure bone thickness: (1) Before grafting, (2) 4 months and (3) 8 months postgrafting, using localized bone gain (mm) as the outcome variable. Results: Tomographic analysis revealed bone gain in CG of 3.78 ± 1.35 mm and 4.34 ± 1.58 mm at 4 and 8 months, respectively. TG showed an increase of 3.79 ± 0.52 mm and 4.09 ± 1.33 mm after 4 and 8 months, respectively. Histomorphometric analysis revealed that, for CG, MT- and NMT-related values were 52.3% ± 16.78% and 47.70% ± 5.55%, respectively, whereas for TG, they were 65.04% ± 20.98% and 34.96 ± 10.38, respectively. Conclusion: Although radiographic bone gain appeared similar between the groups, the use of BMAC obtained via the BMAC® method revealed an increased mineralization trend in the anterior maxilla. It must be highlighted, however, that this is a preliminary study with a relatively small sample population and further studies with larger sample sizes are needed to verify these results. Background: Chemical agents used for gingival retraction affects the smear layer. Aim: To determine the effect of three different chemical agents used for gingival retraction systems on smear layer. Materials and Methods: Four human premolars were prepared using air-rotor with air-water spray to receive full crown restoration. Three of them were treated with 21.3% aluminum chloride for 10 min, 0.05% oxymetazoline hydrochloride for 10 min, and expasyl for 2 min, respectively. One sample was left untreated. Then, the tooth specimens were rinsed with tap water to remove any residue of test materials. All the samples (treated and untreated) were processed by scanning electron microscope (SEM). Processed samples were examined under SEM at ×2400 to evaluate the effect of chemical agents on smear layer. Results: SEM examination revealed that 0.05% oxymetazoline hydrochloride for 10 min produced no alteration to smear layer followed by minimum alteration by expasyl for 2 min and complete removal of smear layer with etching of dentin with 21.3% aluminum chloride for 10 min. Conclusion: 0.05% oxymetazoline hydrochloride and expasyl are kind to smear layer. Objective: Recent years have witnessed a renewed interest to determine a quantifiable relationship between mandibular advancement performed with an orthodontic appliance and the resulting airway volume. The study was conducted to evaluate the volumetric changes in pharyngeal airway space using cone-beam computed tomography (CBCT) in Class II division 1 patients with retrognathic mandible treated by Forsus-fixed functional appliance and to compare them with their pretreatment findings. Materials and Methods: Thirty patients with Class II division 1 malocclusion of age group 10–17 years were selected randomly and evaluated for changes in pharyngeal airway volume with and without Forsus-fixed functional appliance. Patients in each group underwent CBCT scan of head and neck region at pretreatment stage and 6 months after the initial scan. Institutional approval for the project was obtained from the Ethical Committee. Volumetric changes of upper (oropharynx) and lower (hypopharynx) pharyngeal airways were measured on scanogram using computer software and intragroup comparisons were done. Results: There was a statistically significant increase in the volume of both hypopharynx and oropharynx and also total airway volume in patients treated with Forsus-fixed functional appliance. Three-dimensional reconstruction of the airway also demonstrates a considerable increase in pharyngeal airway space. Conclusion: Forsus-fixed functional appliance can be a promising appliance for improving pharyngeal airway volume in Class II division 1 patients with retrognathic mandible thus preventing obstructive sleep apnea and other respiratory problems in future. However, the long-term implications of this treatment modality need further consideration and a longer period of follow-up. Aim: The aim of this in-vitro study was to assess the influence of shallow and deep palatal forms on the movement of teeth during the processing of complete denture prosthesis. Materials and Methods: Maxillary casts with shallow and deep palatal forms were selected and duplicated to make 10 casts of each palatal form. Base plates were constructed and teeth were arranged in their anatomic positions. Metal pins with true apex were placed on the central groove of the right and left first molars and one on the incisive papilla area as a reference point. Casts were scanned using i-CAT Vision Q 1.9 (i-CAT cone beam 3D dental imaging system by Imaging Sciences International, PA, USA), which has 360° rotational tomography. The distances between the apices of metallic pin inserts on the teeth and fitted point of reference were recorded in buccopalatal axes at waxed up stage, after deflasking, and after finishing and polishing. Results: Results showed a statistically significant movement of teeth in shallow and deep palatal forms during all stages of complete denture processing. In shallow palatal form dentures, there was a significant tooth movement in palatal direction between Stages 1 and 2 (P ≤ 0.05) and buccal movement between Stages 2 and 3. In deep palatal form dentures, teeth showed a statistically significant (P ≤ 0.05) movement in buccal direction during all stages of denture processing. 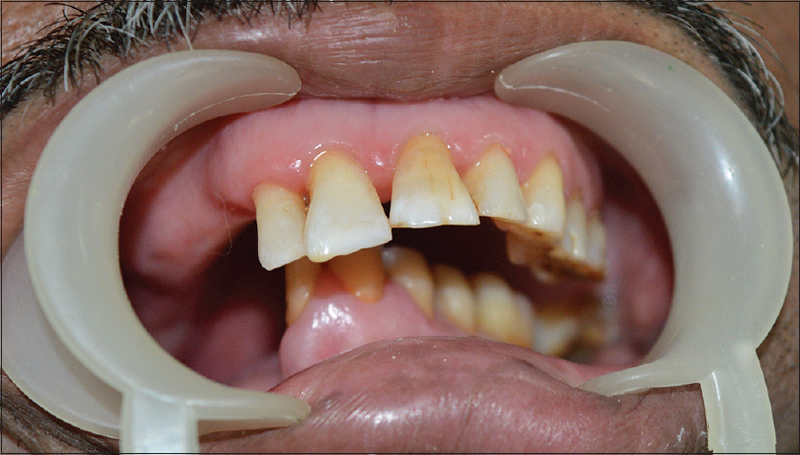 Conclusion: Teeth showed significant movement during processing of acrylic resin dentures. Overall, the movement of teeth in shallow palatal form dentures was in palatal direction, whereas in deep palatal form dentures, the movement of teeth was in buccal direction. Background and Objectives: Various extraction protocols have been followed for successful orthodontic treatment. The purpose of this study was to evaluate the extraction protocols in patients who had previously undergone orthodontic treatment and also who had reported for continuing orthodontic treatment from other clinics. Materials and Methods: One hundred thirty eight patients who registered for orthodontic treatment at the Faculty of Dentistry were divided into 10 extraction protocols based on the Orthodontic treatment protocol given by Janson et al. and were evaluated for statistical significance. Results: The descriptive statistics of the study revealed a total of 40 (29%) patients in protocol 1, 43 (31.2%) in protocol 2, 18 (13%) in protocol 3, 16 (11.6%) in protocol 5, and 12 (8.7%) in Type 3 category of protocol 9. The Type 3 category in protocol 9 was statistically significant compared to other studies. Midline shift and collapse of the arch form were noticed in these individuals. 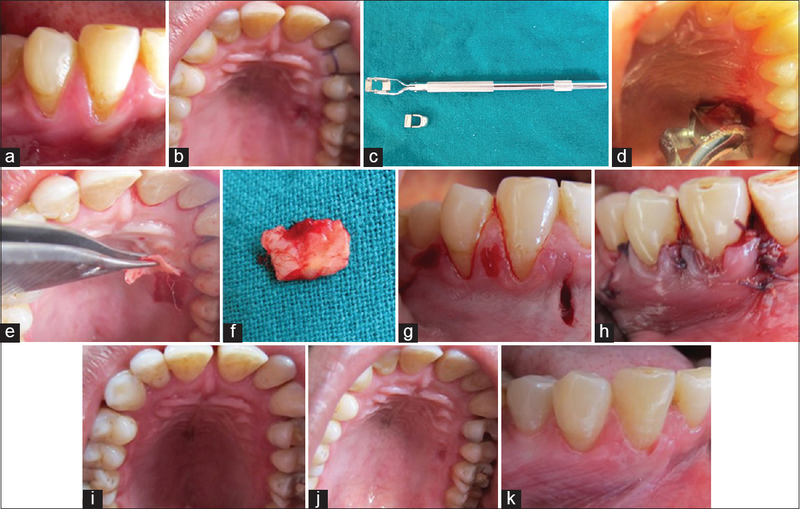 Conclusion: Extraction of permanent teeth such as canine and lateral incisors without rational reasons could have devastating consequences on the entire occlusion. The percentage of cases wherein extraction of permanent teeth in the crowded region was adopted as a treatment option instead of orthodontic treatment is still prevalent in dental practice. The shortage of orthodontists in Malaysia, the long waiting period, and lack of subjective need for orthodontic treatment at an earlier age group were the reasons for the patient's to choose extraction of the mal-aligned teeth such as the maxillary canine or maxillary lateral incisors. 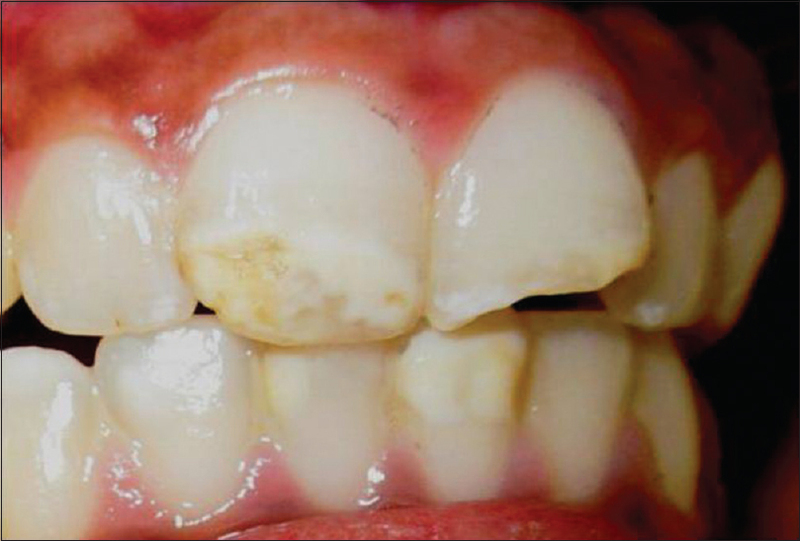 Background: The survival of atraumatic restorative treatment (ART) restorations would be enhanced if near total elimination of cariogenic microorganisms could be done in the process of cavity cleaning before placing a restoration. Thus, use of disinfecting agents for achieving this goal could herald a new beginning in the field of contemporary dentistry. Aim: To assess and compare the cavity disinfection efficacy of APF gel, Brazilian Propolis, Diode Laser, and 2% chlorhexidine (CHX). Materials and Methods: The study was a randomized, single blinded, parallel grouped, active controlled trial. 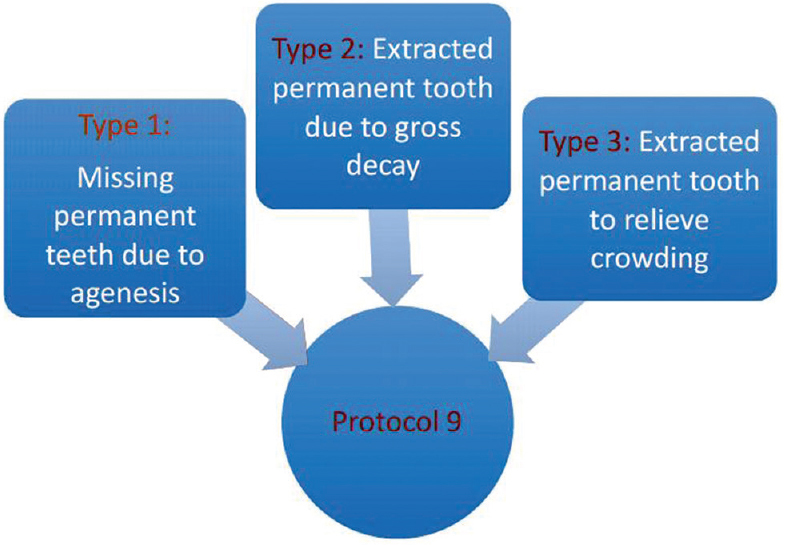 Eighty primary molars in 68 children with cavitated dentinal occlusal caries were randomly assigned into four groups (20 teeth each) Group I: APF gel; Group II: Propolis; Group III: Diode Laser, and Group IV: 2% CHX (control). After cavity preparation using ART procedure, dentinal samples collected before and after disinfection with respective agent of the group. These samples were subjected to microbiological evaluation, for total viable count (TVC) on blood agar, Streptococcus mutans on mutans-sanguis (MS) agar, and Lactobacilli (LB) on Rogosa agar. Results: Intragroup comparison (Wilcoxon signed rank test) showed significant reductions in TVC, MS, and LB counts in all the groups. Pairwise Mann–Whitney test showed APF gel had least bacterial reductions among the agents tested. Conclusion: This study illustrated the need for cavity disinfection. Diode Laser and Brazilian Propolis are equally effective as 2% CHX in cavity disinfection. The oral cavity is an open ecosystem that shows a dynamic balance between the entrance of microorganisms (bacterial, viral or fungal), colonization modalities, nutritional balance, and host defenses against their removal. The oral lesions including aphthous ulcerations, herpes labialis, oral candidiasis, oral lichen planus, and angular cheilitis some of the common entities encountered in the clinical practice. A variety of treatment options is available in the literature for all of these lesions and conditions. Topical ozone therapy is a minimally invasive technique that can be used for these conditions without any side effects. Aim and Objectives: To evaluate the efficacy of ozonized olive oil in the treatment of oral lesions and conditions. Materials and Methods: A longitudinal study was carried out on 50 patients (aphthous ulcerations, herpes labialis, oral candidiasis, oral lichen planus, and angular cheilitis). The ozonized olive oil was applied twice daily until the lesion regresses for a maximum of 6 months. 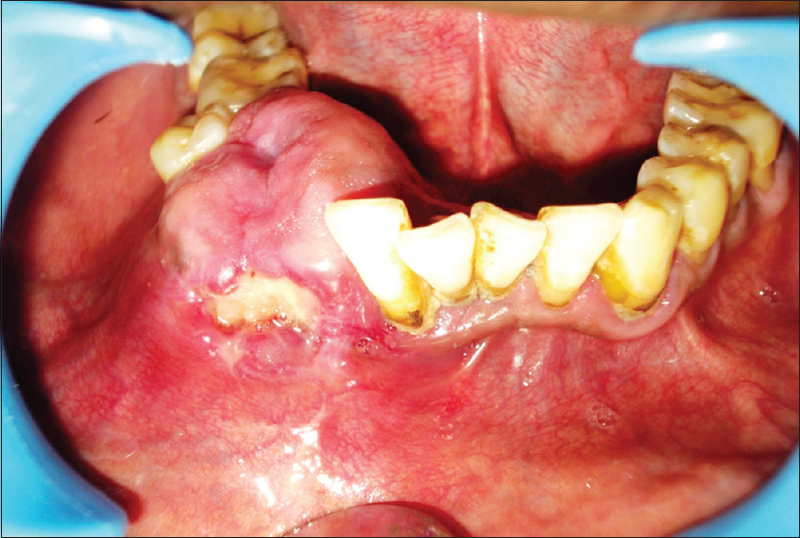 Results: All the lesions regress in patients with aphthous ulcerations, herpes labialis, oral candidiasis and angular cheilitis or showed improvement in the signs and symptoms in oral lichen planus patients. No toxicity or side effect was observed in any of the patients. Conclusion: Ozone therapy though requires a gaseous form to be more effective, but topical form can also bring out the positive results without any toxicity or side effect. Hence, it can be considered as a minimally invasive therapy for the oral infective and immunological conditions. Introduction: Literature reveals that masticatory load on denture bearing tissues through complete dentures should be maximum on primary stress bearing areas and least on relief area in accordance with the histology of underlying tissues. A study to validate the existing beliefs was planned to compare the pressure on mucosa using selective pressure technique and minimal pressure technique, with the incorporation of two different impression materials utilizing the pressure sensors during secondary impression procedure. 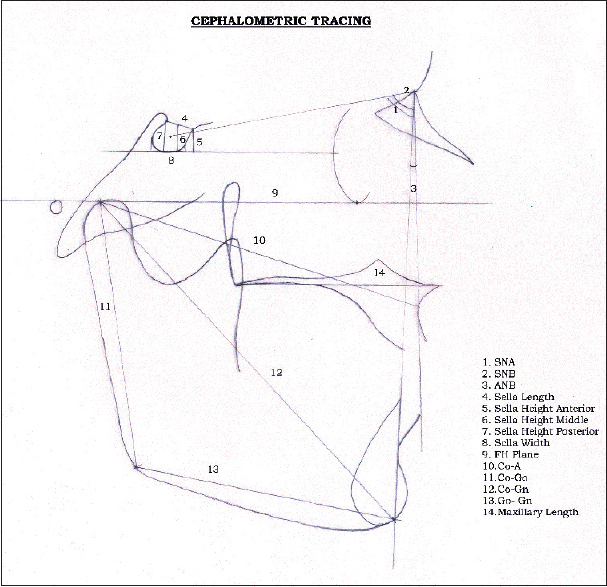 Materials and Methods: The study was performed using a maxillary analog. Three pressure sensors were imbedded in the oral analog, one in the mid palatine area and the other two in the right and left ridge crest. Custom trays of two different configurations were fabricated. The two impression materials tested were light body and zinc oxide eugenol. A total of 40 impressions were made. A constant weight of 1 kg was placed, and the pressure was recorded as initial and end pressures. Results: A significant difference in the pressure produced using different impression materials was found (P < 0.001). Light body vinyl polysiloxane produced significantly lesser pressure than zinc oxide eugenol impression materials. The presence of relief did affect the magnitude of pressure at various locations. Conclusion: All impression materials produced pressure during maxillary edentulous impression making. Tray modification is an important factor in changing the amount of pressure produced. The impression materials used also had a significant role to play on the pressures acting on the tissues during impression procedure. 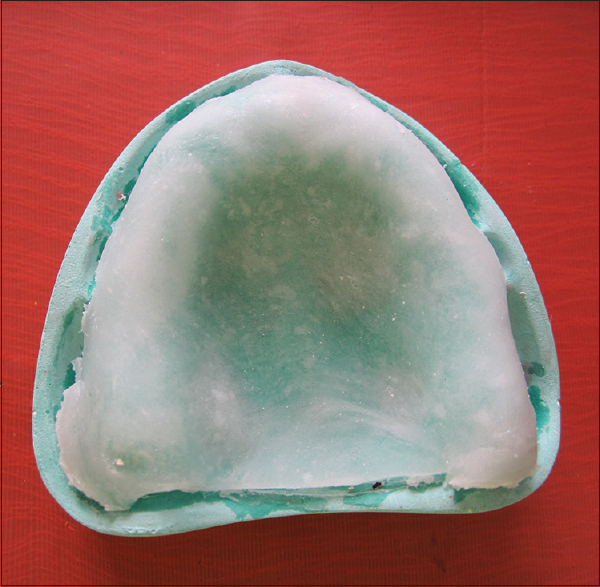 Clinical Implication: Light body VPS impression material may be recommended to achieve minimal pressure on the denture bearing tissues in both selective as well as minimal pressure techniques. Introduction: Sella turcica is an important cephalometric structure and attempts have been made in the past to correlate its dimensions to the malocclusion. However, no study has so far compared the size of sella to the jaw bases that determine the type of malocclusion. The present study was undertaken to find out any such correlation if it exists. Materials and Methods: Lateral cephalograms of 110 adults consisting of 40 Class I, 40 Class II, and 30 Class III patients were assessed for the measurement of sella length, width, height, and area. The maxillary length, mandibular ramus height, and body length were also measured. The sella dimensions were compared among three malocclusion types by one-way ANOVA. Pearson correlation was calculated between the jaw size and sella dimensions. Furthermore, the ratio of jaw base lengths and sella area were calculated. Results and Conclusion: Mean sella length, width and area were found to be greatest in Class III, followed by Class I and least in Class II though the results were not statistically significant. 3 out of 4 measured dimensions of sella, correlated significantly with mandibular ramus and body length each. However, only one dimension of sella showed significant correlation with maxilla. The mandibular ramus and body length show a nearly constant ratio to sella area (0.83–0.85, 0.64–0.65, respectively) in all the three malocclusions. Thus, mandible has a definite and better correlation to the size of sella turcica. A tooth with blunderbuss canal and open apex can be an endodontic challenge because of difficulty in obtaining an apical seal, and existing thin radicular walls which are susceptible to fracture. To overcome the limitations of traditional long-term calcium hydroxide apexification procedures, nonsurgical one step apexification using an array of materials such as mineral trioxide aggregate (MTA) has been suggested. However, adequate compaction of MTA in teeth with wide open apices can be an arduous task, and an internal matrix is required for controlled placement of MTA against which obturating material can be condensed. 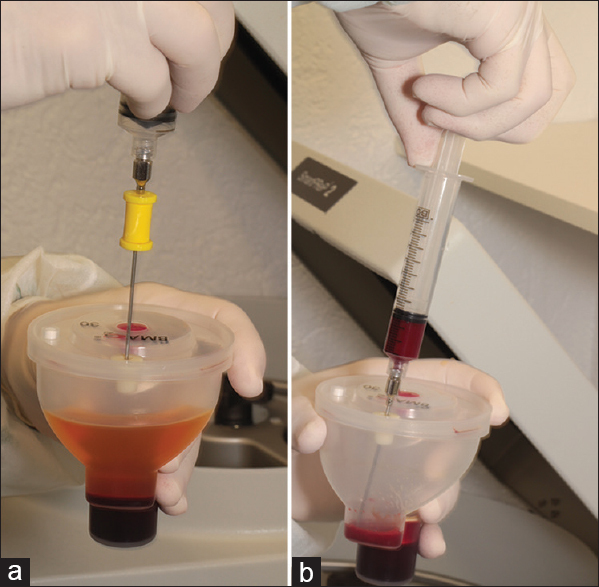 Platelet-rich fibrin (PRF), a second generation platelet concentrate containing several growth factors that promotes hard and soft-tissue healing, has been used as an internal matrix to create an apical plug of MTA and hence prevent extrusion of filling materials. This case series presents the endodontic management of immature permanent teeth with open apices using internal matrix of autologous PRF membrane and one step apical barrier placement of MTA. Myofibroma is a rare benign localized or generalized proliferation of myofibroblastic tissue occurring mostly in infants or children. In the oral region, most lesions occur in the mandible, lip, buccal mucosa, and tongue; however, the lesions arising in the maxilla are very rare. Myofibroma has an aggressive clinical presentation and is often treated aggressively because of an inappropriate diagnosis. A unique feature of central myofibroma of the jaws is the potential for teeth and other odontogenic structures to be involved by tumor. We report a case of myofibroma arising in the left side of the maxilla of a 12-year-old girl and describe the differential diagnosis from other spindle cell lesions of neural and smooth muscle origin. We treated the case using surgical excision under general anesthesia. Immunohistochemical staining was done for establishing the diagnosis since histopathological diagnosis with conventional staining could not distinguish myofibroma from spindle cell tumors. 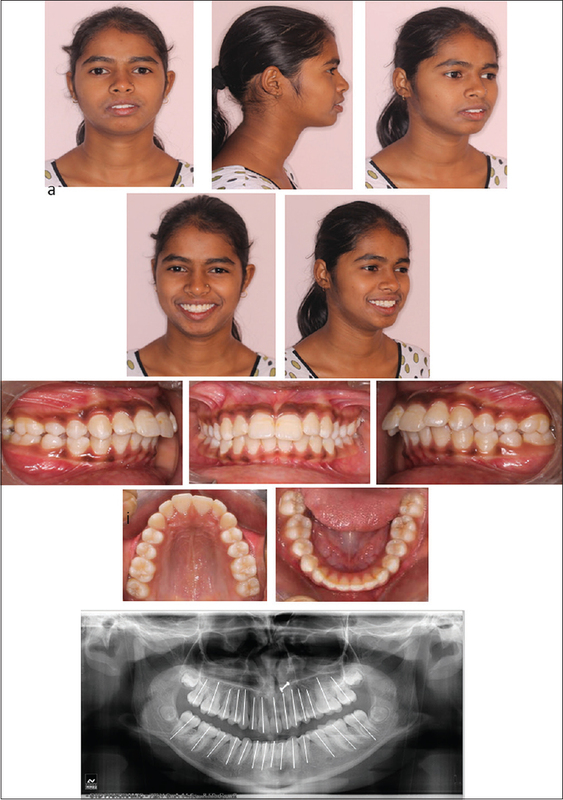 This case report deals with the successful orthodontic treatment of a 14-year-old female patient having Class II malocclusion with bidental protrusion using standard edgewise prescription. She reported with forwardly placed upper front teeth and difficulty in closing lips. She had prognathic maxilla, retrognathic mandible, and full cusp Class II molar and canine relation bilaterally with overjet of 7 mm. She was in cervical vertebrae maturation indicator Stage IV. The case was treated by fixed extraction mechanotherapy. Interarch Class II mechanics was used to retract the upper incisor and to mesialize the lower molars. Simultaneously, Class I mechanics was used to upright lower incisors. Tip back bend, curve of Spee, and extra palatal root torque were incorporated in upper archwire to maintain molars in upright position and prevent extrusion and deepening of bite, respectively. There was satisfactory improvement in facial profile at the end of 24 months. After a follow-up of 6 months, occlusion was stable. The aim of the present paper is to emphasize the importance of the mandibular interforaminal neurovascular bundle with a case and make a warning to dentists and surgeons during oral and maxillofacial surgeries, such as implant replacement, bone harvesting, genioplasty, open reduction of a mandibular fracture, and cyst enucleations at this region. 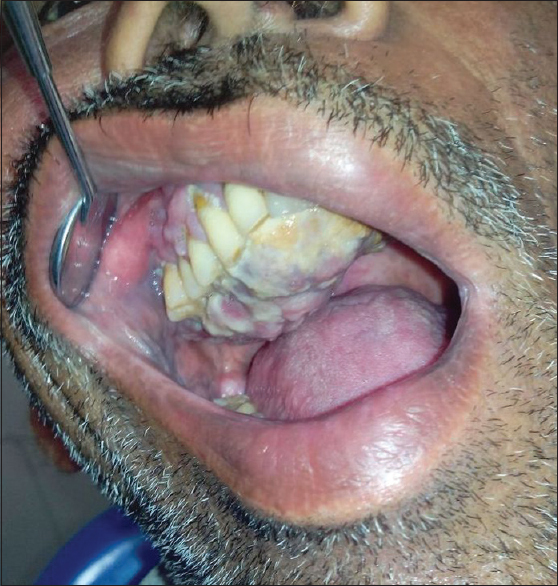 In this paper, we present a 58-year-old male who referred with pain and a tingling sensation on the left lower lip. After radiographical, extraoral and intraoral examinations, findings indicated the lesion to be a cyst which was related with a periapical lesion of the canine tooth and extracted socket of first premolar tooth. After removal of a cyst, the mandibular incisive nerve was documented which was in relation to cyst cavity. 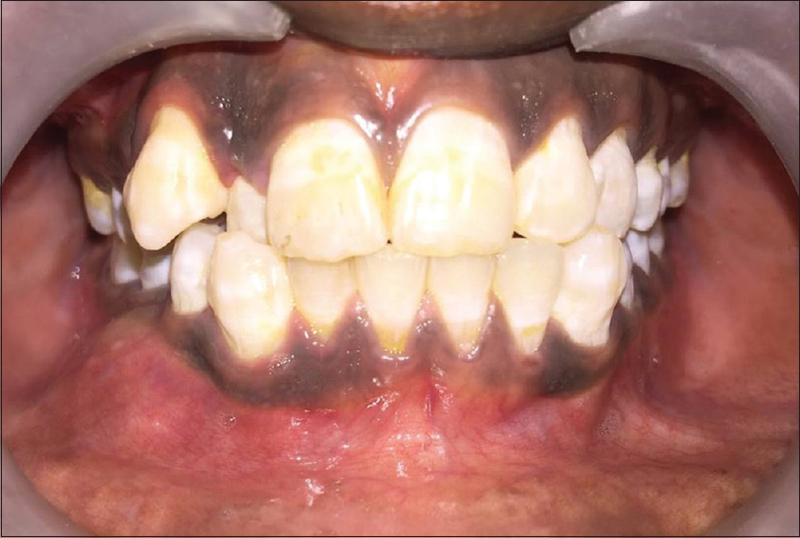 This case report describes the application of fixed functional appliance in the treatment of an adult female having Class II division 2 malocclusion with retroclination of upper incisors. Fixed functional appliance was used to correct the overjet after the uprighting of upper incisors. Fixed functional appliance was fitted on a rigid rectangular arch wire. Application of fixed functional appliance achieved a good Class I molar relationship along with Class I canine relationship with normal overjet and overbite. Fixed functional appliance is effective in the treatment of Class II malocclusions, even in adult patients, and can serve as an alternate choice of treatment instead of orthognathic surgery. This is a case; wherein, fixed functional appliance was successfully used to relieve deep bite and overjet that was ensued after leveling and aligning. We demonstrate that fixed functional appliance can act as a “noncompliant corrector” and use of Class II elastics can be avoided. Oral malignant melanoma (OMM) is a rare tumor of melanocytic origin, accounting for 20–30% of malignant melanomas at the mucosal surface and 16% intra-orally. Hard palate and maxillary gingiva are the most common involved sites. In this case series, we present varying patterns of presentation of three cases of OMM with one case of distant metastasis. All cases in the current series presented at an advanced stage and died within a year of diagnosis. In conclusion, due to the aggressive clinical course and poor prognosis of this deadly lesion, it is of paramount importance to maintain a high index of suspicion for early detection and diagnosis for any pigmented lesion in the oral cavity. Ameloblastoma is a common benign odontogenic tumor with multiple histologic types. 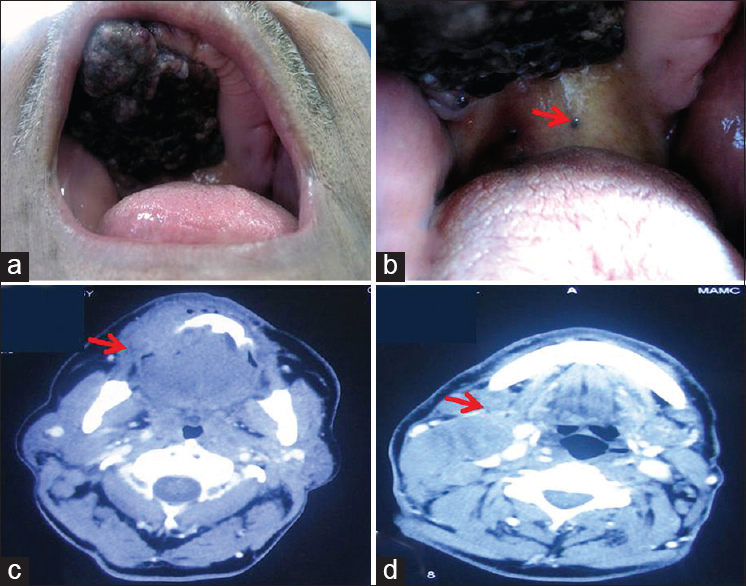 This case report describes an unusual type of ameloblastoma called “Hybrid Ameloblastoma” with features of both follicular and desmoplastic ameloblastoma in a 50-year-old female. This is a very rare form of ameloblastoma as <30 cases have been reported so far in literature. Though this rare form of ameloblastoma is only a histologic variant, it poses a great challenge to diagnosticians and thus to surgeons as there will be mismatch of biopsy reports at different sites in the same tumor thereby changing the treatment plan. 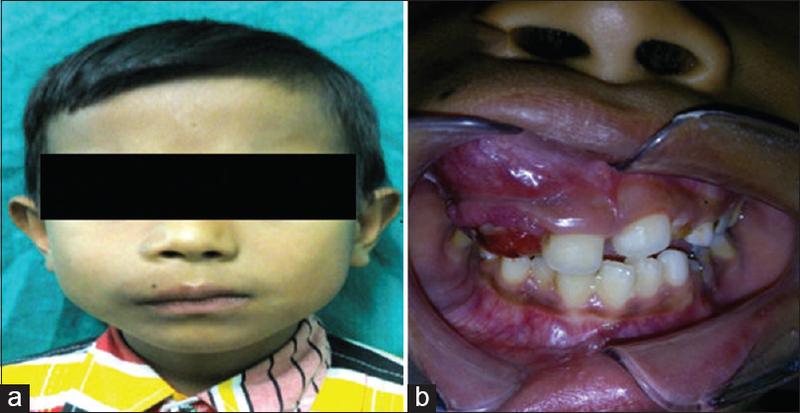 This case report is one such example of diverse presentation of this ameloblastoma with conflicting histopathological diagnosis at initial biopsy and on surgical excision. Calcifying epithelial odontogenic tumor (CEOT), also known as Pindborg tumor, is a rare odontogenic epithelial neoplasm. So far, nearly 200 cases have been reported in the literature. We are reporting a case of CEOT in a 42-year-old male patient with painless bony swelling in the mandible. The clinical, radiographic, and histopathologic features are discussed with relevant references. 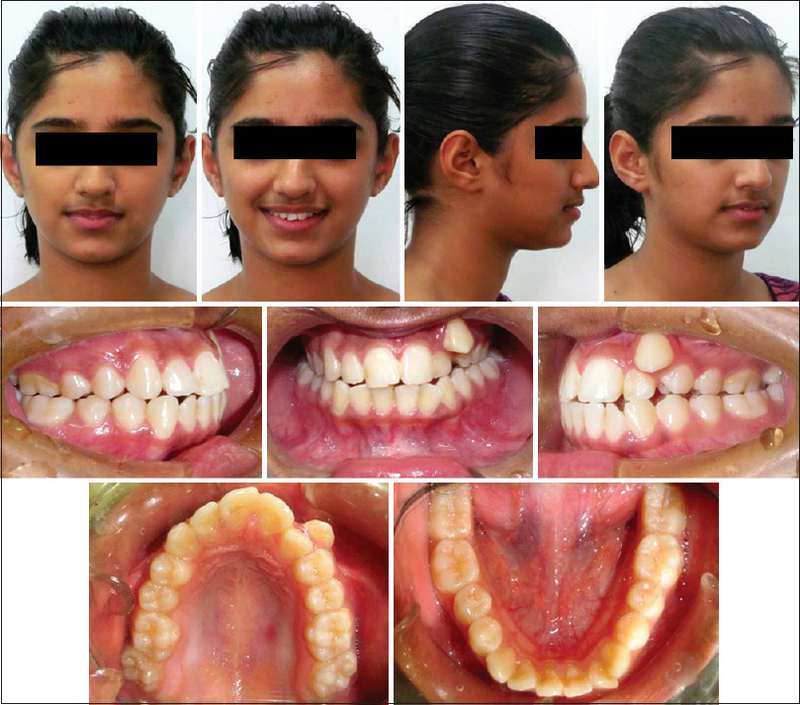 Orthopedic correction of skeletal Class III malocclusion in a growing patient is crucial as it can circumvent future surgical procedures. Further, as surgery is done only at a later stage, early treatment helps to avoid the detrimental effects produced by the facial disfigurement on the patient's social life. 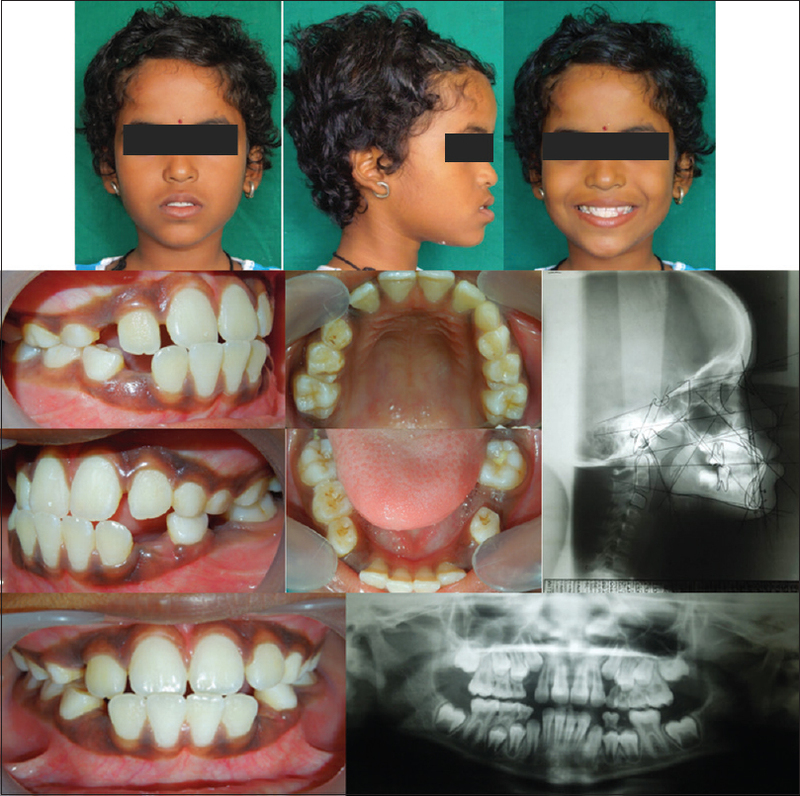 This case report describes the treatment of a child aged 9 years 6 months who had a skeletal Class III malocclusion. The treatment plan involved the use of a reverse pull headgear (facemask) and multibracket appliance therapy resulting in successful correction of the malocclusion. The treatment results were highly satisfactory resulting in improved facial esthetics, a skeletal Class I with a Dental Class I molar and canine relationship, an ideal overjet and overbite. Thus, dentoalveolar camouflage, if done in properly selected cases, alleviates the need for surgical intervention. The patient is being monitored until the end of growth to ensure the stability of treatment results. Management of orthodontic cases often requires extraction of permanent teeth. The decision making regarding extractions depends upon the arch length tooth material discrepancies, the growth pattern, general profile, and arch asymmetries. Unique orthodontic problems may command special treatment lines to be taken. 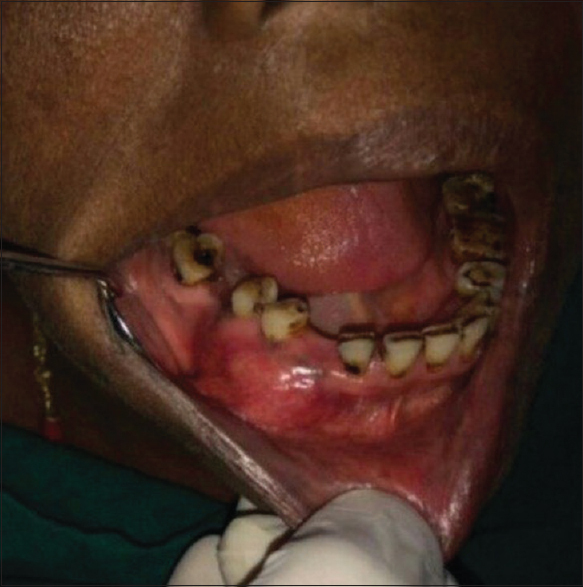 The present report describes a case with unilateral buccally blocked out canine and bilateral posterior crossbite, for which unilateral premolar extractions were performed achieve esthetic and functionally stable occlusion. Dilated odontoma is the most extreme form of dens invaginatus. The lesion appears as a roughly spherical mass that does not resemble a tooth but in a way appears tooth - like on radiographs due to somewhat similar radiodensity. The lesion is mostly spherical in appearance and hence the term “dilated.” Occasionally, we come across cases of simultaneous pathologies. Here, we report two cases of a dilated odontoma one of which is associated with dentigerous cyst and in other case dilated odontoma pushing the maxillary sinus superiorly. Histologically, the mass was composed of dentinal tubules. These morphological and histological features are compatible with those of a dilated odontoma. Aneurysmal bone cyst (ABC) is a nonneoplastic rare pathologic entity of the jaws. Its locally aggressive nature and high recurrence rate after curettage make surgical resection a better treatment option. Here, we present a case of ABC of maxillary alveolus and its management by alveolectomy followed by white head varnish pack application in the surgical defect. Anaplastic large cell lymphoma (ALCL) is an uncommon disease, accounting for <5% of all cases of non-Hodgkin's lymphoma. We report a case of 48-year-old male who presented a clinically benign swelling in the right anterior palatal region since last 2 months. Radiographic evaluation showed no bone loss in palatal area. Histological and radiological examination was in favor of a peripheral reactive lesion like pyogenic granuloma or a benign salivary gland tumor. Immunohistochemistry confirmed the diagnosis of anaplastic lymphoma kinase-negative (ALK(−)) ALCL. Further laboratory tests ELISA for human immunodeficiency virus (HIV) and CD4 cell count was done which showed positivity for HIV. To the best of our knowledge, it is the first case of ALK(−) ALCL in the hard palate presenting as the first clinical manifestation of acquired immune deficiency syndrome. Treating diverse maxillofacial patients poses a challenge to the maxillofacial prosthodontist. Rehabilitation of hemimandibulectomy patients must aim at restoring mastication and other functions such as intelligible speech, swallowing, and esthetics. Prosthetic methods such as palatal ramp and mandibular guiding flange reposition the deviated mandible. Such prosthesis can also be used to restore speech in case of patients with debilitating speech following surgical resection. This clinical report gives detail of a hemimandibulectomy patient provided with an interim removable dental speech prosthesis with composite resin flange for mandibular guidance therapy.